396 pages | 153 B/W Illus. 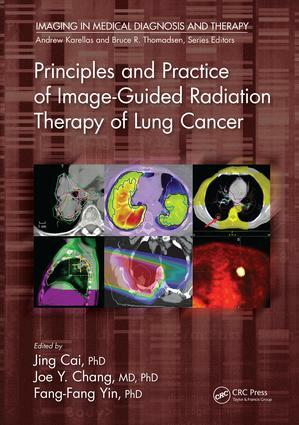 This book gives a comprehensive overview on the use of image-guided radiation therapy (IGRT) in the treatment of lung cancer, covering step-by-step guidelines for clinical implementations, fundamental principles and key technical advances. It covers benefits and limitations of techniques as well as quality and safety issues related to IGRT practice. Jing Cai, PhD, is an Associate Professor of Radiation Oncology at Duke University Medical Center. Joe Y. Chang, MD, PhD, is Professor in the Department of Radiation Oncology at The University of Texas MD Anderson Cancer Center in Houston. Fang-Fang Yin, PhD, is Chief of the Division of Radiation Physics, Professor of Radiation Oncology, and Director of the Medical Physics program at Duke University. Jing Cai, PhD, is an associate professor of Radiation Oncology at Duke University Medical Center. His research is focused on developing and clinically implementing novel image-guided radiation therapy techniques. He has published more than 50 peer-reviewed journal articles and over 130 conference abstracts. He regularly provides scientific reviews for journals and conferences, and servers as expert reviewer for grant applications. His research has received federal, charitable, and industrial funding. Joe Y. Chang, MD, PhD, is professor in the Department of Radiation Oncology at The University of Texas MD Anderson Cancer Center in Houston. He is also Clinical Section Chief for Thoracic Radiation Oncology and Director of the Stereotactic Radiotherapy Program. He earned his PhD in cancer biology at the University of Texas MD Anderson Cancer Center, and earned his MD from Shanghai Medical College in China. He performed clinical residency at Rush-Presbyterian St. Luke Medical Center in Chicago. He is board certified in radiation oncology, and is recipient of numerous honors and is an active member of several professional organizations. Fang-Fang Yin, PhD, is director of the DKU Medical Physics program. He has served as Chief of the Division of Radiation Physics and Professor of Radiation Oncology at Duke University since 2004. The author of more than 200 refereed publications and book chapters, Yin’s research interests include image-guided radiation therapy, informatics in cancer treatment, advanced planning and delivery techniques, and quality assurance. Yin is a Fellow and Member-at Large of the Board of Directors of the American Association of Physicists in Medicine (AAPM). He earned his Ph.D. in Medical Physics from the University of Chicago.